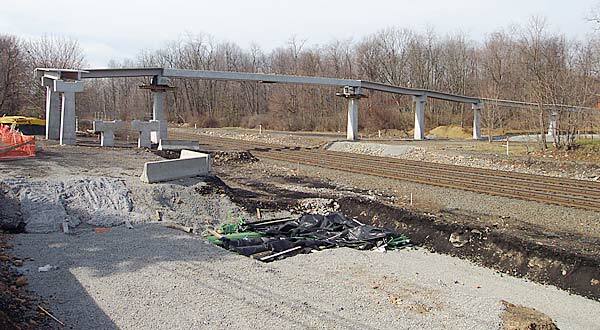 Work continued on the new footbridge project through December 2001 with progress reaching this point. See below for specific captions under each photo, taken the morning of March 9, 2002. For an earlier progress report from Fall 2001, click here. 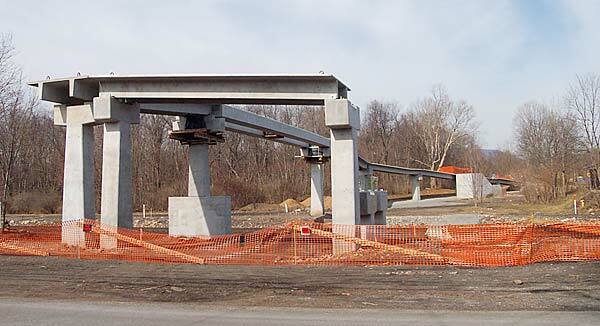 For some photos of the completed Route 865 Realignment Project, click here. All the concrete supports have been completed on the north (far) side of the Norfolk Southern mainline, with several remaining to be constructed on the south side. Unlike the north side, the walkway will double back passing under itself and reaching ground level just behind the yellow-canvassed equipment in the extreme left of the first photo. The bright yellow and blue building visible between two of the supports is the T-ball field located in the community park. This westward view clearly shows the span across the Norfolks mainline, with the unfinished structural portion in the foreground. Green steel reinforcing bars can be seen lying on the ground, partially covered with black plastic. The original Pennsylvania Railroad passenger station used to reside near the highest support on the far side of the tracks. This view shows the long, gradual grade that the north side of the bridge takes as it gains the necessary height to cross the railroad. The large, concrete area in the distance is a set of steps that provide an alternate way to reach the walkway.